In Greek cookery onions and garlic form the base of many dishes and pies. These much loved ingredients were widely used in ancient times both in cooking and for medicinal purposes. Onions, garlic, and leeks were also considered to be an aphrodisiac. From the most ancient of times, garlic was believed to have magical and therapeutic properties, and was also considered an aphrodisiac. 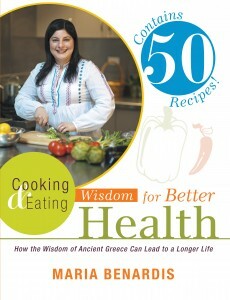 In the times of Homer, Greeks ate garlic daily with bread, as a condiment, or added to salads. It was the main ingredient in a garlic paste which we now have come to know as skordalia a Greek staple. Hippocrates treated various conditions with garlic. He used garlic to treat cancerous tumors. He recommended garlic for pneumonia and other infections, digestive disorders, as well as using it as a diuretic and a substance to improve menstrual flow. The ancient Greek Olympic athletes were given garlic to enhance their performance. Dioscorides also note its medicinal properties and shared that garlic “it clears the arteries, and eaten either raw or boiled lessens old coughs. With salt and oil it heals erupted pimples. With honey it takes away freckles, running ulcers on the head, dandruff, and psoriasis”. Garlic is rich in potassium, iron, calcium, magnesium, manganese, zinc, and selenium. Garlic aids in digestion and respiratory tract conditions. Garlic has antibiotic and antiviral properties that help treat colds and infections. Garlic has also been used to lower cholesterol levels and treat cardiovascular problems such as high blood pressure and stroke. It has also been considered a natural aid for the prevention of some cancers. I eat the roasted garlic as is or on some toasted bread. You can also toss it in pasta, potato salad and add it to soups before serving. Preheat the oven to 400°F/200C. Using a knife, cut off 1/4 to a 1/2 inch of the top of cloves, exposing the individual cloves of garlic. Place the garlic heads in a baking dish. Drizzle a couple teaspoons of olive oil over each head and make sure the garlic head is well coated. Season with sea salt and cracked pepper. Bake for 30-35 minutes or until the cloves feel soft when pressed. 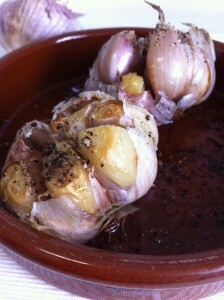 Allow the garlic to cool and then use your fingers to pull or squeeze the roasted garlic cloves out of their skins. They are ready to eat as are or to use in your favourite recipe.